Are you a pistol parent who lets your kids be the first to have a water pistol on holiday? Middler hates to be soaked, so if you are, I cheerfully plan your demise from the first appearance of water cannons. Asking pistol loving parents if they could ask their kids to only soak other kids with water pistols and leave the ones without them alone, you usually get a wine induced slur about letting the weans be weans. At this point, I am usually tempted to pour a bottle of freezing water over said parents, and dump my kids soaking wet clothes at the door to their tent or caravan, so that they stumble over sodding rags on their stotting midnight trips to round up their two year olds, and pay a visit to the vodka extractor pot. “They’re having fun” is commonly spouted, but I’ve yet to find any pistolly challenged child on the opposite end of an empowered pistol bearer having fun. Smiling sweetly, I just popped down to the local Tesco and armed my three with water pistols of their own. Watching a slurrer carefully, she’s tempted to come over and complain about her daughters being soaked through, twice. Now she’ll have 4 piles of wet clothes to deal with tonight. Tee hee hee. Glad you’ve got some sun. Better today, but poured here yesterday. We certainly picked the right fortnight to have been away for. Lots of sunny weather. 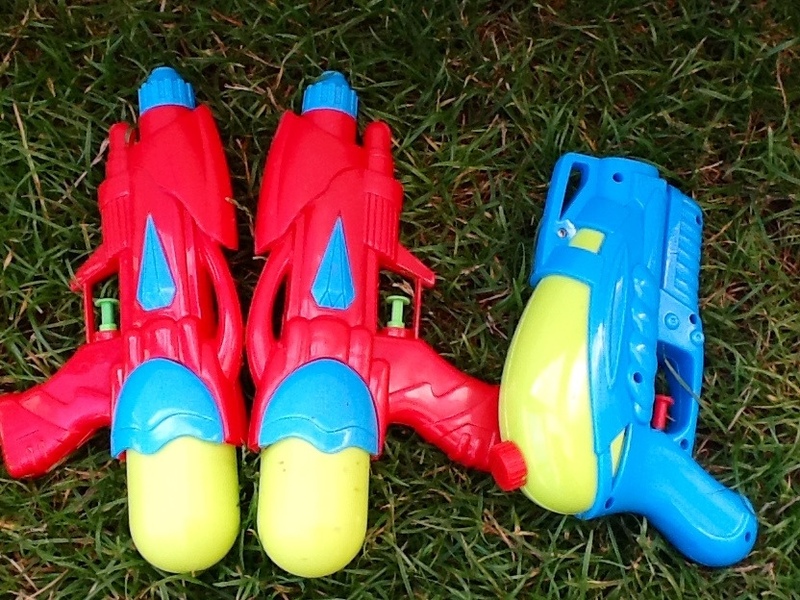 my kids loved water pistols out their own back door, but not something I would let them loose with on holiday, and like you my hard and fast rule was only soak the others with guns. You never know whether said unarmed child may be going somewhere and need to stay clean and dry. Stepping backwards would be scary indeed. Thankfully we only have them on caravan sites on in the back garden. Could be really dangerous out the front.